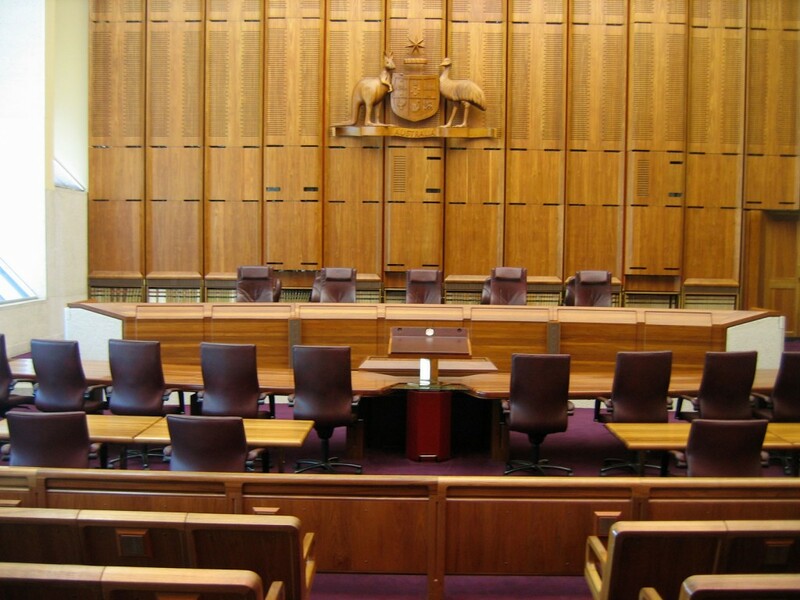 The High Court of Australia, as its name suggests, is the highest of all Australian courts. It was formally established by Section 71 of the Commonwealth Constitution and given its form, structure and procedures by subsequent acts of the Federal Parliament. Historically, the High Court was a mobile court that travelled to and sat in the various State capitals as caseloads required. It later followed a rotating schedule, moving from State to State at different times of the year. The High Court had no court building of its own but used the facilities of State Supreme Courts. 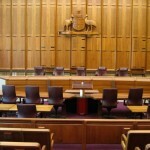 In the 1960s, it was decided to permanently locate the High Court in Canberra, so a new court building was commissioned. Since 1980 the majority of High Court matters have been heard there, though it occasionally sits elsewhere as the need arises. The High Court is comprised of seven Justices, one of whom is the Chief Justice. Collectively, these Justices are referred to as ‘the bench’; any hearing involving all seven Justices is referred to as the ‘full bench of the High Court’. Justices are appointed by the Executive Council, after a process of informal consultation between the Prime Minister, Cabinet, the Federal Attorney-General and the Attorney-Generals of the States. Appointees must be a judge in a Federal, State or Territory court. All High Court Justices are compulsorily retired when they reach the age of 70. The current Justices of the High Court are Chief Justice Susan Kiefel (Queenlsand, appointed to the Court in September 2007), Virginia Bell (New South Wales, February 2009), Stephen Gageler (New South Wales, October 2012), Patrick Keane (Queensland, March 2013), Geoffrey Nettle (Victoria, February 2015), Michelle Gordon (Victoria, June 2015) and James Edelman (January 2017). It is our highest appellate court for criminal cases and civil disputes. It provides judicial review for all legislation passed in Australia. It is the body that interprets the Commonwealth Constitution. Our highest appellate court. The High Court is the highest court to which Australians can appeal decisions made in lower courts. Section 73 of the Constitution states that decisions made in State Supreme Courts or any Federal Court can be appealed to the High Court. This right of appeal applies to both criminal and civil matters. The right of appeal to the High Court is not automatic, however. Section 73 also specifies that the High Court’s appellate jurisdiction can be limited by “such exceptions and subject to such regulations as the Parliament prescribes”. Legislation governing the High Court requires that applicants have special leave to appeal before the High Court will hear appellate cases. This special leave is granted only on matters of law and where the public interest might be served by hearing the appeal. It is not possible to appeal disputed claims or verdicts, matters of fact or excessive sentences to the High Court. Special leave to appeal is decided by a preliminary hearing before a panel of two or three High Court justices, who decide whether the appeal warrants a full hearing. Judicial review of legislation. The High Court is also responsible for hearing challenges to legislation passed by Australian parliaments. Statutes passed by the Commonwealth, States or Territories, as well as delegated legislation formulated by subordinate authorities, can all be challenged in the High Court. The High Court then decides whether this legislation is constitutionally valid, or whether it conflicts with other laws. If the High Court upholds that the legislation is valid then there is no further avenue of appeal for the applicant. Interpreting the Constitution. When hearing appeals or reviewing legislation the High Court is sometimes required to interpret the Constitution. This is similar to judges in lower courts having to interpret legislation. Constitutional interpretation can have a major impact on the law, so it is serious business. Matters of constitutional interpretation are generally heard by the full bench of the High Court and attract considerable attention from the media and the legal fraternity. As with statutory interpretation, the Justices have the option of consulting external materials or aids when forming their interpretation. In some cases the High Court has even used transcripts of the 1897-98 constitutional convention, to help them reach conclusions about the meaning of the Constitution and the intent of its drafters.